One of the great joys of public observing sessions is introducing non-observers to the immensity of our local sliver of the universe. Hubble imagery and the amazing ground-based astrophotography of the last 25-or-so years is all well and good, but to explain to a new observer that the photons from the Whirlpool Galaxy (M51) currently hitting their retina have been on a 23 million year voyage, or to put all of the Andromeda Galaxy (M31) into the field of view and explain that the photons on one side of the eyepiece have been traveling 150,000 years longer than the photons on the “other” side of the eyepiece, or to aim a Coronado PST at the Sun and point out that the sunspots on the surface are 3 or more Earths across – these are the images that really put the universe, and our place in it, into perspective. One of the great joys of lecturing on introductory astronomy is being able to describe all of these visuals in greater detail, showing how observation and the rest of the Scientific Method have produced great order in our Nighttime Sky (for, at least, the parts of the sky we can see in the backyard on a clear, dark night). As is true for many of the other physical sciences, a book chapter or wikipedia page alone can be far less informative, and is definitely far less engaging, than a chance to have a conversation with someone who knows the topic well enough to relate complicated concepts by drawing from many additional resources. And, at a time when we continually fret the state of STEM education in the US, there is nothing better for an academically-inclined scientist (me) than to have someone many years their (my) junior process the information on a slide and ask a question that (1) clearly shows a grasp of the physics involved and (2) they (I) don’t have a good answer to. Lecturing keeps the lecturer just as sharp! 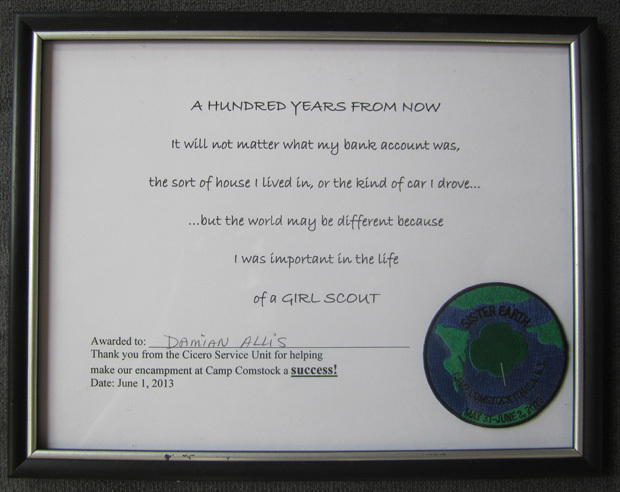 It is with those points in mind that CNYO hosted a Girl Scout lecture on Saturday, June 1 at Camp Comstock in Ithaca, NY as part of their requirements for earning their Night Sky badge. Unfortunately, the mostly cloudy and otherwise unpredictable night before made the Nighttime Sky observing component impossible, compacting the badge requirement section into a combined lecture/solar observing session that went well over allotted time with no (voiced) complaints. Instead of highlighting lecture points, my goal here is to provide a few pointers for perspective astro-lecturers of kids and young adults (although I suspect the same applies for all generations). In my case, my leisurely 1 hour drive turned into a compressed 40 minute drive as I waited for a police officer to take my eyewitness statements after a fender-bender on Route 13. Lesson #1 – Don’t text while driving! – Explaining how the Earth moves (rotation vs. revolution) and why the North Star doesn’t appear to. This part of the lecture was complemented by the CNYO How The Night Sky Moves brochure. D. Why Learn The Constellations? … and “How The Moon Was Born” (a video that shows the history of the Earth-Moon system and the ever-impressive Theia impact). – Light pollution is bad, but it does help new astronomers find the bright starts in constellations. Air pollution also helps, but at a much higher cost. We should be avoiding both! The biggest lesson I learned from watching professionals present to kids is to ask those kids lots of questions and let them be A driver in the presentation (but not THE driver, as you may never get the wheel back). It keeps the audience engaged, it lets others try to explain a concept in a way that the other-others may benefit from, it breaks up the monotony of the single-presenter approach, and it gives kids a chance to “show off” their scientific knowledge (which some of them love to do). The best kinds of questions are (1) the very easy ones (how many planets) and (2) the ones that no one there (likely) has the answer to but that all can think about and take a swing at (alien life, what happens at a black hole, how big is the Sun, etc.). If you’re lecturing to a group of 10 year olds, find a friend with a 10-year-old and see what they (don’t) know. If the kid isn’t astronomically-inclined, assume that their knowledge is similar to that of other 10 year olds in a Regents-guided state. The Girl Scout lecture was to a room of 13 to 17 year olds, and I am pleased to report that I had to move on to the “heavy questions” quite early in the lecture. When I think about the Sun, the first two questions that come to mind are not (1) Isn’t there a disease where you can’t be in the Sun because your skin breaks apart? and (2) I heard that some people try to live on only sunlight with no food. Isn’t that crazy (answer: yes)? As CNYO’s Larry Slosberg has determined for his observing sessions, the afternoon sky is a perfectly good substitute for the nighttime sky provided you (1) have a solar filter and (2) plan around the first quarter Moon. In the case of (1), the Sun is an excellent observing target for new observers because they very likely have never looked at it through filters and, as you can stress in your discussion, it is the reason why we’re here. 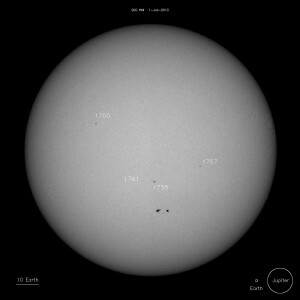 The Sun on 1 June, 2013. From SOHO/NASA. As for (2), it is also a reason why we’re here, but the magnified Moon, either against a black or blue afternoon backdrop, never fails to impress. To help lead discussion at subsequent daytime observing sessions, the solar-centric Girl Scout session instigated the CNYO solar observing brochure available for download at: A Guide For Solar Observing.